This Vanilla Icing Recipe is one of the most versatile frostings around; just pair it with any kind of cake and cookies which crosses your mind and it will turn into an extravagant treat. 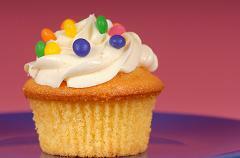 Vanilla frosting is a piece of soft creamy heaven on cakes. Vanilla, an ancient flavor, is a delight for our senses. Apart from your regular sponge or vanilla cake or cupcakes, this vanilla frosting recipe compliments spicy cakes to perfection and makes your sugar or oatmeal cookies even more lip smacking. It is hard to imagine that such a creamy, fluffy frosting with luxurious taste can be so easy and inexpensive to make. All you need is butter, icing sugar, milk and of course vanilla; and you can create the masterpiece. Team it up with additional flavors of your choice - coconut, nuts, chocolate and make you cake stand out among others. Its whitish hue allows you to tint it suitably for any occasions and increase its visual appeal. Apart from the rich fluffiness, its taste of vanilla ice cream leaves you licking the fingers even after gobbling down the cake. So next time you bake a cake or cupcakes, make this vanilla icing recipe to complement your baking and turn your cupcakes or cakes into creations. Whip butter in an electric mixer on medium speed for about 8 minutes or until it becomes creamy. Pour in rest of the ingredients and continue blending them on low speed for a minute, then change the speed and keep mixing for another 6 minutes or until the mixture becomes light and fluffy.